What Are the Effects of Adderall Abuse? Who is At Risk for Adderall Addiction? Adderall is a prescription amphetamine approved by the FDA to treat Attention Deficit Hyperactivity Disorder (ADHD), and it works by regulating impulse control and hyperactivity. Although relatively safe when used as prescribed, it is designated as a Schedule II drug under the U.S. Controlled Substance Act because of its high potential for dependence and abuse. Dependency often occurs after the drug is used for a long period, but in some cases, the body can develop a tolerance very quickly. Sleep difficulties, including difficulty falling or staying asleep. Restlessness, hyperactivity, nervousness, rapid speech, talkativeness. Skin changes such as hives, rash, blistering or itching. Stomach pain, constipation, nausea and diarrhea. Abuse effects occur even in young, otherwise healthy people. Marked mental changes and/or mental illness. Pounding heartbeat and cardiac arrhythmia. 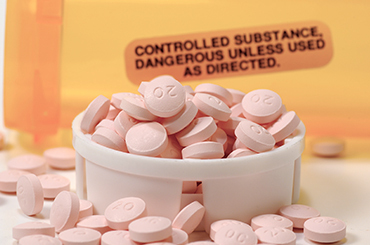 Even though Adderall may be prescribed to you, prescription drugs frequently lead to addiction. Please call 1-888-993-3112Who Answers? for more information about Adderall addiction treatment options. Abuse of Adderall becomes even more dangerous when the drug is combined with other substances. For example, mixing a stimulant such as Adderall with central nervous system depressants like heroin or other opiates can mask the effect of each drug, creating a scenario with a high risk of overdose. Combining Adderall with alcohol (a depressant) is particularly risky because users don't pass out or fall asleep. They can keep going even though they are extremely drunk, which may result in alcohol poisoning, accidents or risky sexual behavior caused by poor judgment and loss of inhibitions. Other consequences of mixing Adderall and alcohol include dangerous physical symptoms such as confusion, memory loss, abnormal heart rate and increased blood pressure. Failure to fulfill home or family responsibilities or commitments associated with work or school because of Adderall use. Repeated use of the substance in physically dangerous situations such as operating mechanical equipment or driving a car. Arguments with a partner or spouse. Recurrent arrests or other legal problems connected with using Adderall. Adverse experiences in childhood such as neglect or abuse increase. People with psychiatric illnesses such as anxiety or depression. People with a personal or family history of addiction. People who are not diagnosed with ADHD and purchase or obtain Adderall illegally for purposes other than a prescribed medicine. Teen and young adults are at high risk of addiction, primarily because Adderall is so widely used as a study aid and recreational drug on college and high school campuses. The medication is cheap and readily available, and because it is a 'prescription medication,' many users underestimate the risks. Parents of children diagnosed with ADHD are often concerned about the risk of addiction when a child takes prescription Adderall. Additionally, studies conducted by psychologists at UCLA indicate that children with ADHD are at increased risk of abusing substances such as tobacco, alcohol, and marijuana later in life. Red flags include taking the medication more frequently than prescribed or using increasingly large amounts to achieve the same effect. Adderall is a highly addictive drug that should be used only as prescribed. When used properly, its benefits can be transformational for children with ADHD, however, many experts believe that children are often misdiagnosed and medicated unnecessarily, increasing the risk of addiction. Also, it can be difficult for people to recognize that an addiction exists when they have received legitimate prescriptions. If you or someone you care about is using Adderall without a prescription or in ways other than it was prescribed, seek help from an Adderall recovery program as soon as possible. Getting treatment early can prevent complications that may develop in the future. Don't wait for the proverbial "rock bottom." Locate an NA Meeting Narcotics Anonymous is a 12-step support group for those suffering from addiction to drugs such as Adderall. Find a local meeting for you or your loved one. Counselors are trained to understand the dynamics of addicted families and can help them restore a healthy balance in their lives. 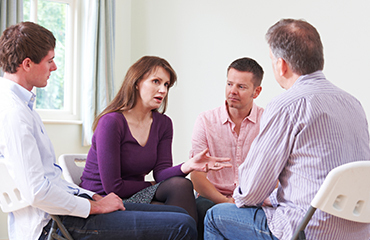 Support groups such as Al-Anon are often beneficial for people who are affected by a loved one's addiction. Skilled counseling can also identify patterns that delay recovery. For example, enabling is a typical reaction by friends and family of addicted people. Although they may sincerely want to help their loved one, enabling postpones treatment that the person needs in order to get better. Enablers often give money, clean up messes or pay for legal problems instead of allowing the person to experience the natural consequences of Adderall abuse. In cases of severe addiction or persistent denial, some families may consider an intervention, in which friends and family confront the person about their addiction with the help of a trained professional. Intervention for Adderall abuse is a big step that should be carefully considered. Treatment for an Adderall addiction begins with detoxification, in which the drug leaves the body. This is sometimes done by gradually tapering the dosage until it can be stopped without adverse effects. However, cravings can continue even after the substance has cleared the body. cope with cravings and can also address underlying issues such as depression or anxiety. Adderall is a difficult addiction that may require more than one course of treatment. A comprehensive aftercare plan that identifies dangerous situations and prevents triggers that can lead to relapse is critical. This option involves attending treatment sessions 2 or 3 times a week and is beneficial for people who want to maintain family and work responsibilities without disruption. Some people prefer outpatient treatment because they want to keep treatment private and prefer not to explain the lengthy time away from school or work. However, it doesn't remove the person from their environment, so the same stresses and temptations are still present. Residential treatment is best for many people because it removes them from their everyday environment and allows focus completely on recovery. Support is available around the clock and days are filled with one-on-one therapy, group therapy, and educational meetings. There are many forms of residential treatment. Standard treatment centers provide treatment in a clean, comfortable atmosphere. Rooms are often shared, and residents may be expected to pitch in with cooking or other chores. Weekends are often set aside for enjoyable activities such as hiking, movies, bowling or shopping. Luxury rehab centers provide treatment in a resort or spa-like atmosphere. A stay at a luxury rehab center includes amenities such as private rooms, housekeeping services, gourmet meals, swimming pools, massage, fully equipped gyms, equestrian therapy or yoga. Executive rehab centers cater to executives or professionals that need highly confidential therapy in a setting that provides full access to technology so they can attend meetings and meet the demands of work. PHP provides at least 20 hours of treatment per week. It involves a greater time commitment than Outpatient treatment, but with greater flexibility compared to inpatient treatment. It is sometimes known as "day treatment" because people sleep at their homes, although some programs may provide comfortable housing on the premises. In many cases, people can continue work or school, often on a part-time basis. Treatment options depend on type and severity of the addiction. You can reach our treatment advisors at 1-888-993-3112Who Answers? to help determine which treatment is the best for you. Teens who inappropriately use the substance are at a greater risk of damaging the cardiovascular, gastrointestinal and central nervous systems. Full-time college students are twice as likely to use Adderall as non-students in the same age group. Students use the drug to remain alert and maintain focus and concentration amidst demanding schedules, jobs, final exams and intense study sessions. The drug is used not only as a study aid, but also socially and recreationally, and sometimes as an appetite suppressant. Use of Adderall is also growing among high school students. Long-term effects of Adderall on the brains of young users aren't fully clear, but teens who inappropriately use the substance are at a greater risk of damaging the cardiovascular, gastrointestinal, and central nervous systems. They are also at increased risk of depression, anxiety and psychosis.